Every year I not only struggle to buy the perfect Christmas gift for the outdoorsman in my life, I also get asked for advice on what to get for the outdoorsmas who seems to have everything. So… I thought I would put together a list of items that are sure to be a hit this holiday season and share them with you. In addition to being an outfitter my husband is also a welder; so of course the traditional wedding ring is a no go because of safety reasons. However, the romantic newlywed in me really wanted him to be able to wear a ring. I purchased Aaron an “Obsidian Ultralite Silicone Ring.” The best part is that it looks very similar to his original titanium band. He has worn it to work, puttering around the house and while scouting. These rings are very reasonably priced and considering the variety offered you will be sure to find something that suits your loved one. I even got a band for myself that matches Aaron’s; I wear it with my traditional engagement and wedding rings. I always tend to get my husband the same things: decoys, trail cameras or a piece of camo clothing, so I wanted something different for him. I attended the outdoor show in Red Deer and found Gloria Booth, she is the woman behind Glowz Metal in Westerose. She created our company logo out of stainless steel. She went the extra mile to make sure that it was just perfect. There is also a talented woman out of Leduc who does custom pieces (Melissa Venus at Venus Custom Creations, you can find her on Facebook) she created a beautiful piece for Aaron’s birthday this year and she is currently working on something for me this holiday season. Custom pieces are a great gift idea because you can design something meaningful for your loved one and have it carefully and wonderfully created by a local artisan. For our wedding Aaron and I registered at Cabela’s (I know that surprises many of you…NOT). Anyways, one item that has proven to be a true gem was the Works Sharp Guided Sharpening System Knife Sharpener. It’s the best sharpener we’ve ever had. We’ve had several over the years this has given us the best results. It may not be a romantic gift but it is practical, affordable and something that every outdoorsman can use. I mentioned that Aaron is an outfitter and welder; but he is also a bookworm. The latest winter issue of their favorite magazine makes a great stocking stuffer. Even purchasing them a subscription to a hunting or fishing magazine is always a hit. I renew Aaron’s subscription to the Alberta Outdoorsman every Valentine’s Day. A book that should be on your list for your outdoorsman is, Alberta’s Trout Highway: Fishing the Forestry Trunk Road (I had to replace a copy because it was starting to fall apart from use). A book/magazine is a great way to help your outdoor loving significant other enjoy the off-season. The only downside to this option is that your loved one will have to wait (sometimes rather impatiently). But booking even a local excursion is a super sweet gift. You can make this excursion a couple’s trip or send him with his buddies. For my husband I would book a river fish on the North Saskatchewan (since we don’t have our own boat). Or a sturgeon fishing trip on the Fraser River in British Columbia that would coincide with our vacation to see my family on the coast. 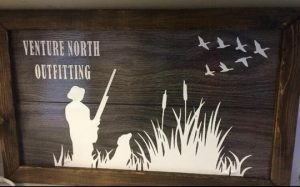 Or maybe even a bird hunt with us!!! Happy holidays from the staff at Venture North Outfitting!